My family can not go without the Green Bean Casserole. It’s pretty much the best side dish for Thanksgiving or Christmas (well, besides the mashed potatoes). I decided that I had to create the perfect Slow Cooker Green Bean Casserole myself, since most recipes I found online either had frozen green beans or jarred alfredo sauce (yuck!). 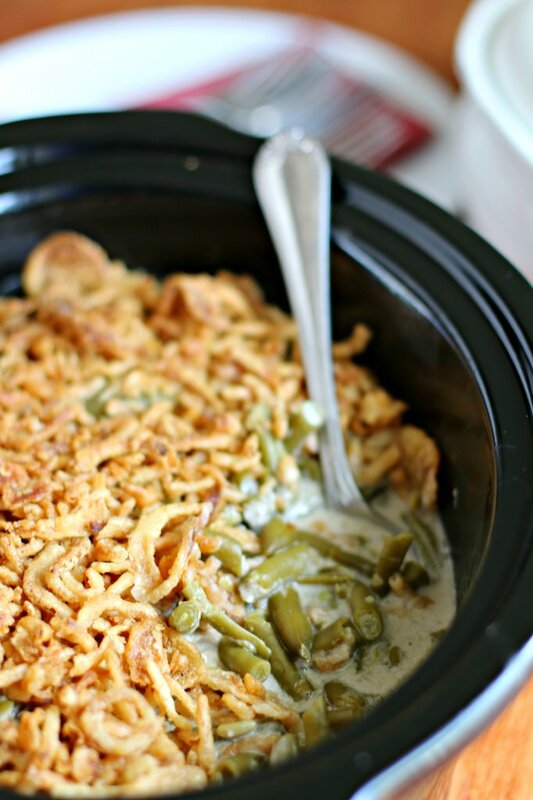 This recipe for Slow Cooker Green Bean Casserole makes a ton, when I made this for thanksgiving, it fed about 15, with lots of leftovers. So, I would think this recipe could serve up to 20 people. At the end of the slow cooking time, I chose to brown the french fried onions on top of the casserole in the oven, it wasn’t a big deal, for the turkey had already been removed from the oven, and all that was left in the oven was the rolls. In a very large bowl, add the cream of mushrooms soup, milk, black pepper, and onion powder, whisk until smooth. Will this recipe still taste as good if I make it for (i.e cut in half?) for 10. How do I adjust the servings? Yes it would work just fine. Cut the entire recipe in half. Just use half a container of onion topping inside, and add the other half at the end. To cut in half is time 1hr 20min? I’m thinking 1 hour 45 min- 2 hours. So you only use 1/2 cup milk for the whole recipe that serves 20? yes, a half cup is just enough to make the soup into a sauce. When the green beans cook, they will add a little liquid to the sauce. This amount of milk works well for this recipe. Sauteed an onion & bacon and added folded in with others. I will let y’all know what my bunch thinks of it! I make it just like this but add a cup or two of shredded mozzarella. It adds just a bit of richness and is soooo tasty! I’ve never mixed in a can of the french onions before, that sounds like a great idea! 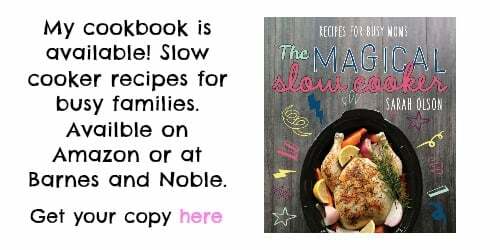 Such a time saver making these in the slow cooker! Great recipe! I love how easy this is and that it feeds a crowd AND frees up the oven and stove! Can you use fresh green beans instead of canned? I’ve never tried this recipe with fresh ones, I bet it would be good! I used fresh green beans last year and will NEVER go back to canned for this casserole. It made all the difference in the world! How many pounds of fresh green beans did you use for this recipe? I stopped using can stuff and I would like to do this recipe for Christmas dinner 🙂 Thank you! You know, I’ve never really been a fan of green bean casserole.. but this recipe just may change my mind. It looks perfect!!! If I make this recipe with fresh green beans instead of canned, do I need to cook the green beans first before putting them in the crockpot? Hi Katrina, I have never made this with fresh green beans. Has anyone tried this recipe with fresh green beans? I cook off my fresh canned beans for about 1 1/2 hours in about a 1T. of salt and just enough water to cover the beans, before I put all ing. in the crockpot. Would french cut green beans work instead of the cut green beans? What other soup can you use instead of the cream of mushrooms? Cream of celery or cream of chicken would work too. I want to use frozen cut green beans. Do I need to cook them first? If so, how long? Can I transfer the casserole to a different serving platter before putting in the oven? The “cream of” soups have gluten in them what do you use instead? Progresso makes a gluten free cream of mushroom soup or you can make your own. I’m using the progresso one! Janet, just a reminder, cream of mushroom soup has gluten in it. I am making this for a holiday party and won’t have an oven available, will the onions cook on top in the crockpot or should I leave them out? What if you browned them at home on a sheet tray and brought them to sprinkle on top. The crock pot won’t help those onions, it may make them soggy if they aren’t browned. I have never used frozen. But I would assume it would take much longer to cook since they are frozen and raw. I think the video said 5 hours on Low? That might be right even if you used a more than the video used. 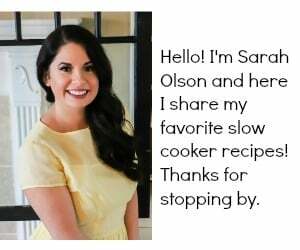 Thank you VERY MUCH for including the size of the slow cooker in your recipe. We have a gazillion of them to choose from so this is a HUGE help. Silly question…do you really use 10 cans of green beans or is that a typo?! Thanks, can’t wait to try this! I wanted you to know I made this for an office potluck last week. It was so easy and was a big hit. We only have two microwaves in our office, so this was an ideal solution to keep the food warm. Thank you for sharing this recipe. I’m so happy to hear that Bob! 🙂 Thanks for letting me know who it worked for you. 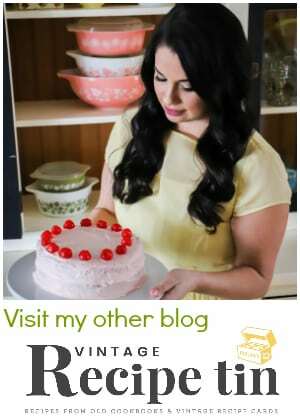 I’m so glad I have found your site…love reading and sharing recipes that are good, but simple to make! I do have one issue….I don’t know if it is the font you have chosen to use or the color of your sites print….but it is very straining on the eye….suggestions that would help me to improve this? The only thing I can think of is if you can get the print of your browser to show larger. For mine on internet explorer I can adjust it on the top right tab to 125% and that helps. I have cooked this casserole for many years and in many ways. (I’m 65 and have been cooking since I was 13.) Lately, I use fresh sliced mushrooms sautéed with sliced green onions (white and green parts) and do not use the fried onion rings-too much fat!. Sometimes all sautéed with bacon. You could use leeks or shallots and I always add some fresh chopped garlic because we love garlic at my house. I also use some panko bread crumbs mixed with grated parmesan cheese and a little melted butter for the topping. Instead of milk I use reduced salt chicken broth. I prefer to use fresh green beans that are parboiled for a tender crisp stage and then mix up all the other ingredients first and gently fold in the beans so they don’t get broken. In a pinch, I use canned beans, but drain them well to remove some of the salt. You can also just cover the top with your favorite cheese. I have used frozen green beans but they have to at least be unthawed in the microwave first. I usually use the oven but I am going to use the crock pot this Turkey Day! Great additions Jo! Cheese and garlic sound so good! Has anyone used frozen green beans? I’ve made this the past two years for Thanksgiving and it’s always a hit! I make it just like the recipe says! Sooo amazing!! Sarah, I did have one question… This year we are traveling quite a ways for Thanksgiving and was thinking to avoid getting up super early to make this. Could I just let it cook in the crockpot overnight on low? I think that would be too much time. Maybe 5 hours on low would be the most it should go. Instead of putting the crockpot insert into the oven to brown the french fried onions I would put them in a separate pan in the oven, and after browning… then sprinkle them onto the casserole in the crockpot. Less chance of causing the insert to crack by placing it into the oven. I’m allergic to mushrooms, can I substitute the cream of mushrooms for cream of celery. I don’t like cream of mushroom soup, so I found a recipe that substitutes sour cream. Work that work with the crockpot? Or would i need to add more milk? What can I do if I only have a 4 quart crock pot? I would cut the recipe in half? The measurements don’t need to be exact, it always turns out no matter what measurements I use. I need to travel about 1hr and 45 min to our Thanksgiving Day destination. Do you think this would still cook well if I got everything in the crock pot-traveled with it and then turned it on? Yes! I plan to do the same. I’m going to make mine the night before and put in the fridge until we travel. Nothing is that perishable. I would not suggest putting your insert in the oven – I did, as suggested in your recipe, and my insert cracked all the way through. 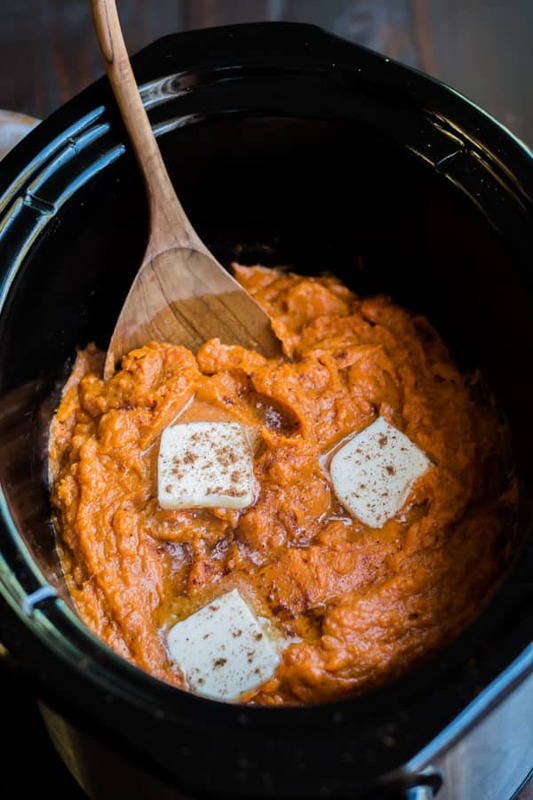 So we are camping this year for Thanksgiving and its why I searched for a crock pot recipe, has anyone done this without final step of putting it in oven with the onions? I myself think the onions are great with out being cooked. what are your thoughts? A new thing I just started doing is browning them in a skillet right before serving. 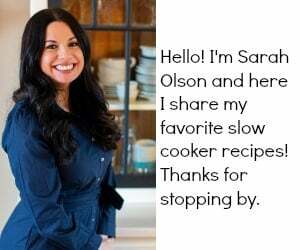 Great idea, Sarah Olson! I think I’ll do that for my hub’s office Christmas Dinner. He signed me up for green beans, and I refuse to make plain old beans.